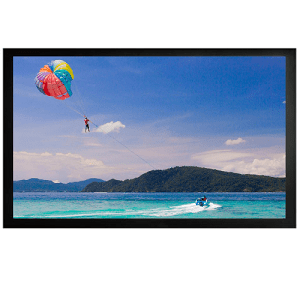 This advanced wall-mount fixed frame screen has eyelets around the screen surface and a system of springs connected to the frame. This system provides better screen tensioning and means a flatter screen surface. The black velvet fabric on the frame provides a luxurious finish to the frame and better light absorption. The FO series screen features a premium high end fabric screen surface. This screen is suitable for home cinema and video presentations in a larger sized room (say 4.5m to 7m wide and 7m+ long) where there is good control of ambient light. Screen surface (viewable area) area is 360cms by 203cms. The frame is 10 cms wide meaning that a minimum screen mounting area of 380cm by 223cms is required.The screen weighs approximately 32kgs. The screen surface is high end matte white projection fabric with a lightproof black back. The material is flame-retardant and mildew-resistant. The screen has a gain factor of 1.1. The frame is aluminium alloy and features a velvet fabric finish. The frame incorporates a spring-tensioning mechanism to provide a flat screen surface. 1 year warranty against defects in materials & workmanship. An optional 3 year warranty is available separately. Spare parts are maintained in our Australian warehouse.